After the most recent update (WinSCP 5.15), WinSCP GUI is very slow to lunch. About 5 mins before the main window pop up. Version 5.14 works fine without any problems. I tried to change the WinSCP configuration storage from Windows Registry, Automatic INI, and custom location in file but the problem persists. The computer that has this problem is operating in a network environment with roaming profiles. My personal computer, (Windows 10 Profesional, no roaming profiles, just a plain installation) works fine as well. File transfers work without any problems. As this seems to be more a GUI problem, unfortunately, i didnt find any options to enable any logs for this stage. I doubt that is WinSCP's fault. The WinSCP installation for that user's roaming profile probably just got corrupted during the update. There is a slightly greater risk of applications getting corrupted in a roaming profile environment. The first thing I would do is uninstall WinSCP for the affected Windows user account with the roaming profile, then reinstall WinSCP 5.15 again from scratch. No updates this time, go directly to 5.15. A nice clean install. I don't see any legitimate reason for it taking five minutes to open a 35 MB application, even across a network. 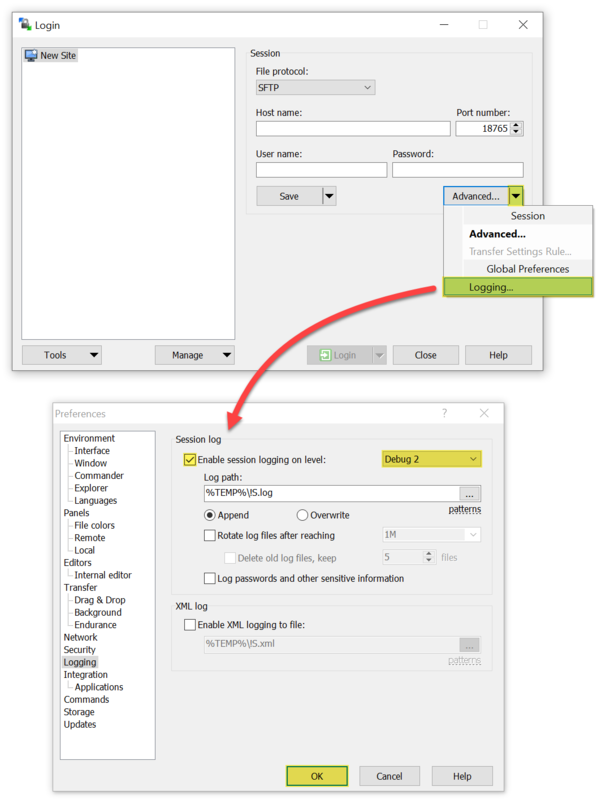 Also, can you test WinSCP 5.15 with another roaming profile in the same environment? One person is too small a sample to draw any conclusions from. I would be interested to see if the problem affected more than one user's roaming profile, or only one user's roaming profile. Suspecting a problem with a particular version of WinSCP is not something I would consider at this early stage. 2) see if performing a reinstall for the affected user resolves the problem. Perhaps you're right and there is a problem with 5.15 on a roaming profile environment, but I think it's worth spending 10 minutes to quickly rule out these other possibilities first. WinSCP is locally installed in the PC's HDD - it is just my desktop and a bunch of folders related to my profile that is stored remotely. I tried to uninstall versions 5.14 and 5.15 removing all keys, configuration files and etc and do a clean reinstall of 5.15, to the default location and also to another disk but the problem still persisted. I can ask for a colleague to log to my computer to see to test if it is a profile issue - but he won't be able to install it as he won't have any administrative privileges for that box. He will open the version of winSCP installed by me. That could still be useful. If only your roaming profile has slow loading times, that would suggest that 5.15 does not always have this problem when used with roaming profiles. You could then focus on removing whatever remnants of your previous installation, in your roaming profile, are causing this problem in your account. That's the best-case scenario. On the other hand, if another roaming profile also experiences this issue, then perhaps 5.15 did introduce a problem—although that seems unlikely to me as I would have thought that the roaming profile aspect of the environment would be fairly transparent to WinSCP. It would be interesting if any other roaming profiles experienced slow loading times, as that would give credence to your initial suspicion that WinSCP may be at fault. I asked a colleague to help me out. Upon logging to the computer, the system realised his profile locally (had not logged to that machine before) and he tried to open WinSCP. Unfortunately, the same issue reproduced. What we noticed that is that winscp lunches in the background but it doesn't pop the MainWindow until some time after. When he opened the task manager, winscp was listed. consuming resources. CPU at about 10% and producing network traffic (see screenshot). Please note that all of these were happening before any GUI had been launched in a newly created local profile. Thanks for testing that with a different user's Windows profile. Can you try enabling logging and collecting some more information that might help Martin to understand what's happening? Hey Guys, I have updated my WinSCP recently to 5.15 and am experiencing the same problem. @vesnikos You are bit lucky as it's opening atlest after 5 minutes. For me it's taking more than 15 minutes sometimes and doesn't open at all. Is there any chance that we can go for the previous download 5.14 or the previous one. Where acn I find those downloads? forgot to log in for the previous post. I am open to help debug the program if it helps. I have exactly the same issue after 5.15 update. I have tried a clean re-install and having the same problem. Takes roughly a minute or longer to load the application. I'm also hitting (what I think is) this issue. Could I get a pointer to 5.15.2 where the fix is, to confirm? Thanks for your report. We do not have a definite fix yet.